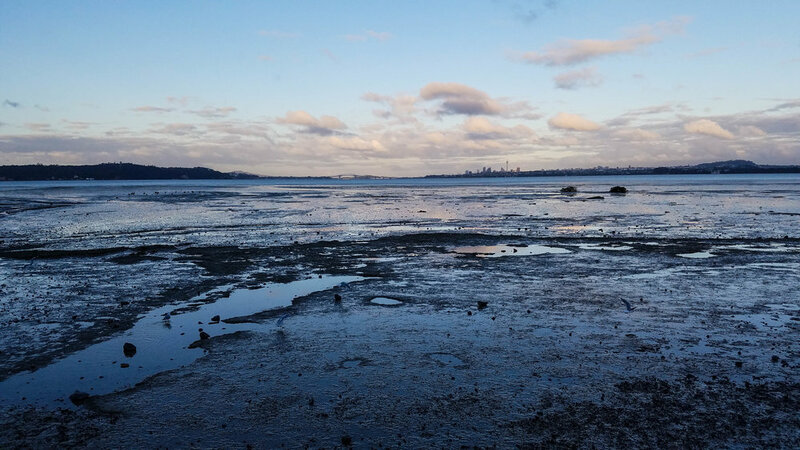 Dowtown from Te Atatu Peninsula. Vintage shopping on K Road. 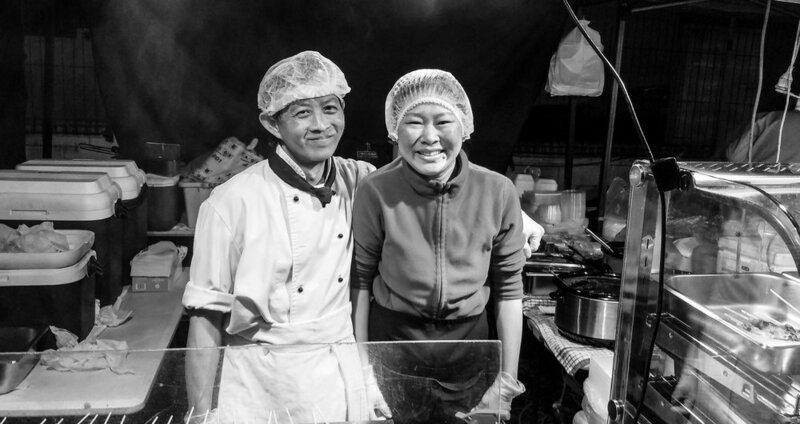 Our friends who fed us satay sticks at the Henderson Night Markets every Thursday. Auckland Sky Tower at night, from below. Man and dog. True love. 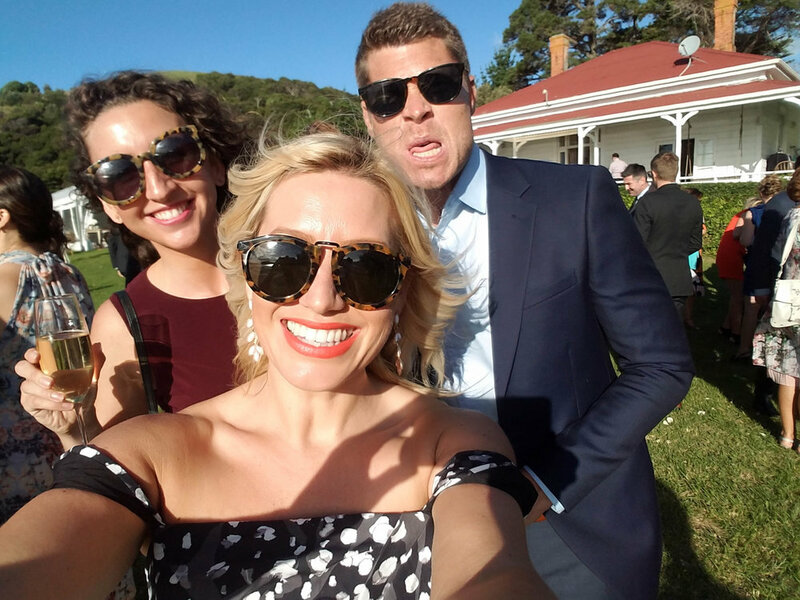 Cleaned up for a Waiheke Wedding. 3/4 of the Stratford Siblings. Bexee, Scott and I. Practically an ad for Karen Walker. Sunset on the Te Atatu Peninsula. Most of my 3 month stint in New Zealand this year consisted of EditMate work (pitch meetings, editing videos, cursing NZ's archaic wifi when uploading and downloading said videos) but I did make sure to step away from my laptop and get out and enjoy NZ's epic landscape. It's one of the oldest settled areas in the Waitakere Ranges and has a tragic past. Maori folklore says a Maori Chief's beautiful daughter drifted off from here after mourning her husband who got swept off to the ocean from a giant wave that hit the cliff. Since then, multiple women have gone missing from this cliff (one just this past March) only adding to the Bay's haunted legend. New Zealand in green, blue and black + white. Some Tai Chi and the Auckland skyline. Smokey in front of Rangitoto. Beach afternoon at O'Neills Bay. Walking on a stormy day. Smokey the dog remains ultimate hiking, swimming, roadtripping and surfing companion. 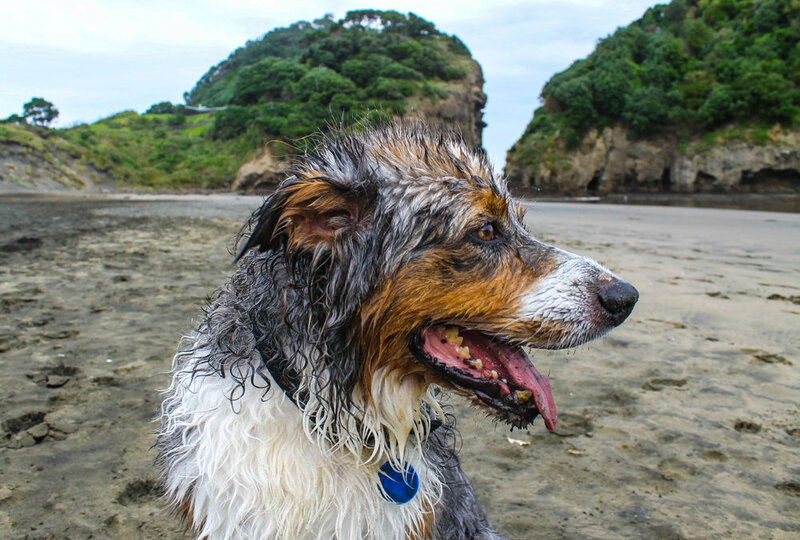 Day at Piha with Smokey. Feeding the neighbors last night's salad leftovers. Kite festival on the Te Atatu Peninsula. Cricket game, out in the country. Note tiny Smokey in the middle of a game of fetch. Scott and Rangitoto in the distance. Scott was back in his homeland sorting out his American Business visa and a few things were happening with EditMate in the southern hemisphere -- so in January, I flew over for a New Zealand summer. It was a joyous reunion with Smokey. And Scott too. Goat. Owner of aforementioned boat. No fish were harmed on this trip (i.e. none were caught). I've been all over the map the last few months. Scott and I left New Zealand to expand EditMate into Australia (and explore along the way), then headed back over the Pacific for a day of swimming in everything that's glorious about America (filtered coffee! right side of the road driving!) in LA before landing in Austin, TX for a week of wedding festivities and taco hangovers. Then, we headed north to Massachusetts where we've settled into my beloved Jamaica Plain, for a TBD amount of time. Until then, here's a few photos from a nice morning at O'Neill Bay in New Zealand. It was a perfect morning for a surf, a nap and an expansive game of fetch for Smokey. Smokey, pondering the meaning of life. Rangitoto Island from Takapuna Beach. Black sand at the west coast's Piha Beach. This year Scott learned what it's really like to date an American: we treat Valentine's Day like an episode of The Bachelor. Making friends at the zoo via food bribery. Day at The Cricket. I had no idea what was happening. Hiking in the Waihi Gorge. Sometimes I get all eye-roll-y-American at Auckland because it's a small place in a tiny country and everything closes at 3 PM. Other times, I drive 30 minutes outside the city and arrive at a magnificent landscape that's a cross between Jurassic Park and Eden. And then I'm just... in awe. Hiking the Waitakere Ranges was one of those times. A lot of the photos I take end up being back-of-head shots of Scott, which may seems like a creative choice or a way to make Scott look ~mysterious~ but really it's because I'm a slow walker and meander my way through life. Hiking. It's just walking! Until there is an ascent involved. Repping the alma mater at the top. ...aaaand he pulls ahead during the descent. My van, looking rather rustic from the rocky, dirt roads. ...and first view in the morning.